The head to head comparison of the Weber Performer Deluxe vs Premium is pretty simple. 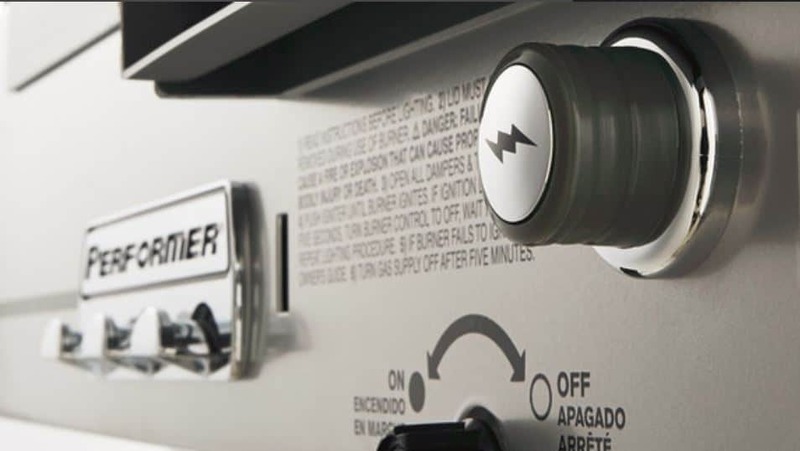 The Performer Deluxe has the “Touch N Go” gas ignition system and the Performer Premium does not. This one feature results in the Deluxe costing about $50 more than the Premium. The question is, do you really want the Touch N Go gas ignition system? Let’s take a quick look as the ignition system. The ignition system on the Deluxe is a burner tube sitting underneath the charcoal grate that is connected to a small propane bottle. The ignition button lights the propane and the propane lights your charcoal. There are multiple ways of using the igniter to light your charcoal. While you can simply make a pile of charcoal directly over the burner the briquettes will not light evenly. It is better to load up the charcoal baskets that come with the grill. Many people prefer to use the gas burner as a way to light the charcoal in a standard chimney. You can take a peek at this technique in the short video below. I have always had mixed feelings about the Deluxe. On one hand it just seems wrong to hook a propane bottle up to a charcoal grill. On the flip side, for many people the difficulty of starting charcoal is what keeps them from grilling on a kettle. 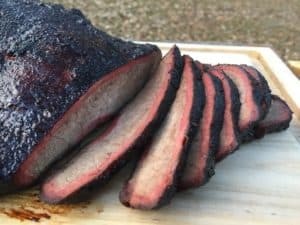 If adding an ignition system is what it takes to get more people to grill using charcoal then I am in favor of using one! Other than the gas ignition everything else between these two grills is the same. They are both 22.5 inch kettles that have been adapted to fit onto a cart instead of the original tripod design of a classic Weber kettle. It surprises some folks when they see that the kettle still has the three leg slots in the base. 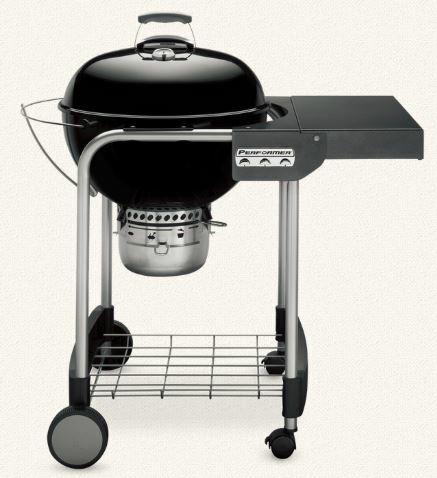 Both of these Weber Performer charcoal grills has assembled dimensions of 43.5″H X 48″W X 30″D. 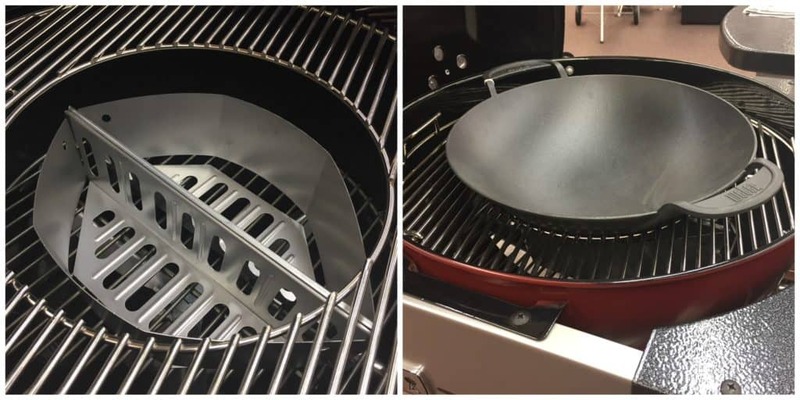 The warranty on these covers the bowl and lid for ten years, the One Touch Cleaning System and all plastic components for five years with the remainder of the grill being protected for two years. Since the actual kettles are the standard 22.5 inch design they are able to accept all of the cool accessories like the kettle rotisserie. These grills are available with kettles that are either black, green or copper. Let’s look at some of the features these beauties have to offer. The two most important features of these grills is the built in work table and the Tuck-Away lid holder. One of the most frustrating things about using a standard Weber kettle is not having anywhere to put the lid when you want to work the grill. And yes, I know about the hook inside the lid but it is not a good solution. The Performer series have a wire frame on the left side of the grill that lets you slide the lid off to the side and store it when you are flipping burgers. Another massive pain point of using a standard kettle is not having a work surface. The Performers come with a painted metal side table that is plenty large enough to hold a couple of slabs of ribs. The combination of the lid holder and grill table is extremely nice and makes grilling on a kettle a really enjoyable experience. Another upgrade that comes with both of these grills is the Gourmet Barbecue System grate. The rods on this grate are thicker than on a standard grate and it has a removable center insert that accepts some cool accessories. You can place your charcoal baskets full of coals directly under the insert and have some serious high heat grilling fun. Here is a video showing this grate system in action with the Sear Grate. It is important to note that the only insert that comes with the Gourmet BBQ System are the standard robs to complete the grate. All of the cool inserts must be purchased separately. Some of the available inserts include a steakhouse sear grid, wok, pizza stone, cast iron griddle and poultry roaster. 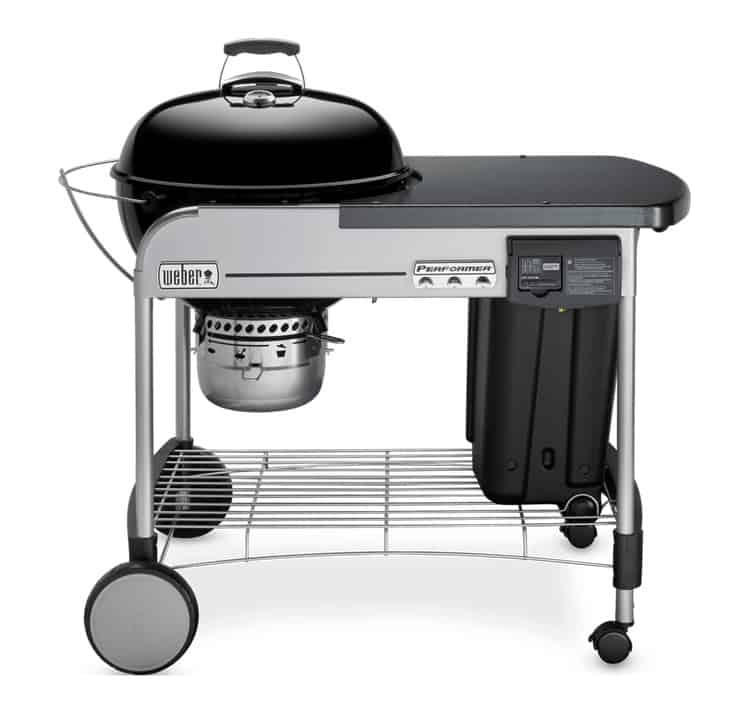 Both grills also come with a large charcoal storage bin under the table. While the bin is designed for charcoal don’t be surprised if you find yourself using it primarily as a handy little trash can. Also included are over sized wheels for easy rolling across your deck, three tool hooks, under cart wire storage rack and highly attractive styling. 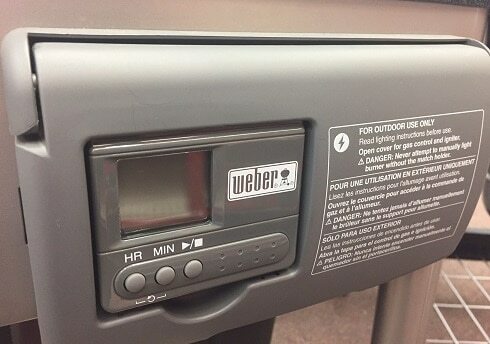 The final notable feature on these grills is that they have a built in slot that stores a removable electronic timer. I am not sure why you would ever need a timer but, hey, you will get one. The reviews for the Deluxe and the Premium are nearly identical, so for the sake of space I will just share the data for the Performer Deluxe. 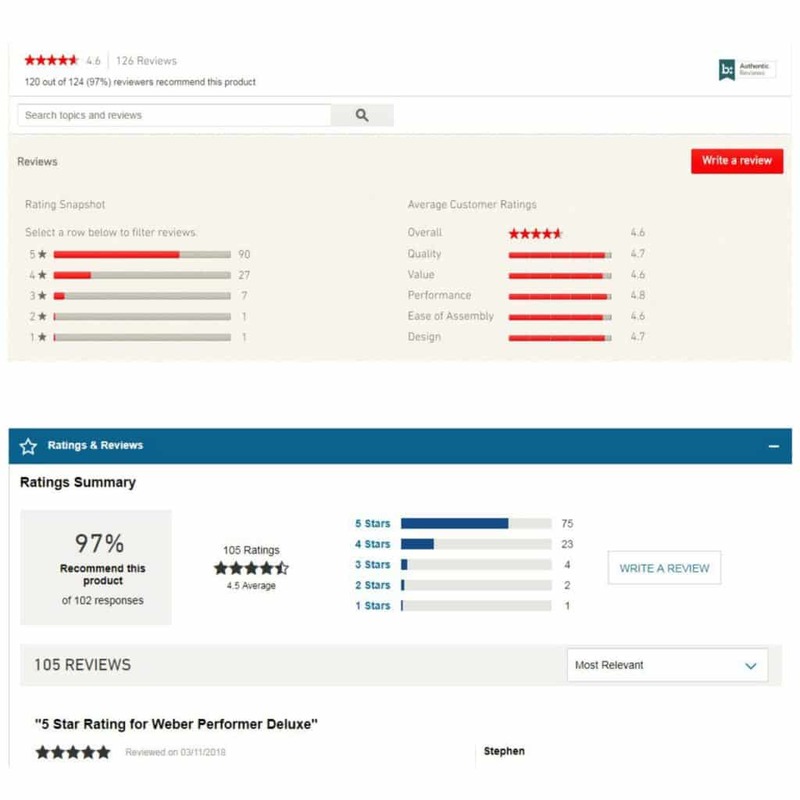 Here is a snapshot of the reviews that were posted over at Weber and Lowes as of 7/6/2018. The reviews from the two locations are just about perfect matches so I don’t think Weber is fudging their numbers. Both sites indicate that 97% of reviewers world recommend this grill which has an average rating of a little over 4.5 stars when the two data sets are combined. Some folks decide to buy the Premium instead of the Deluxe because they don’t want the gas ignition while some people buy the Premium because they are trying to save some money. If you are one of those folks that wants an upgraded kettle but don’t want to pay for features that you don’t really need (like an LED cook timer) then you should give serious thought to the base model Performer. The base model Performer is a 22 inch kettle that has a lid holder and side table, the two most important and functional upgrades. The base model is only available in black and does not have a charcoal storage bin or the propane ignition system. It is also MUCH cheaper than the Deluxe. Both the Performer Deluxe and Premium are amazing grills that are backed up with solid reviews and great customer service. It is worth buying either one just to get the Tuck-Away lid holder and the large painted metal work table. The Touch N Go gas ignition system is available exclusively on the Performer Deluxe and for an extra $50 I think it is worth the money. If you are on a budget then the base model Performer has the two most important upgrades and is still a grilling BEAST.